I spent two weeks at Silver River State Park in Ocala, FL…to be close to doctor appointments and to meet up with some RVing friends. When I arrived there was a mini-car, mini camper group camping there. The park has several well-maintained trails. I hiked most of them while I was there. Friend Soos and her dogs at the end of the River Trail. There is a kayak launch there. 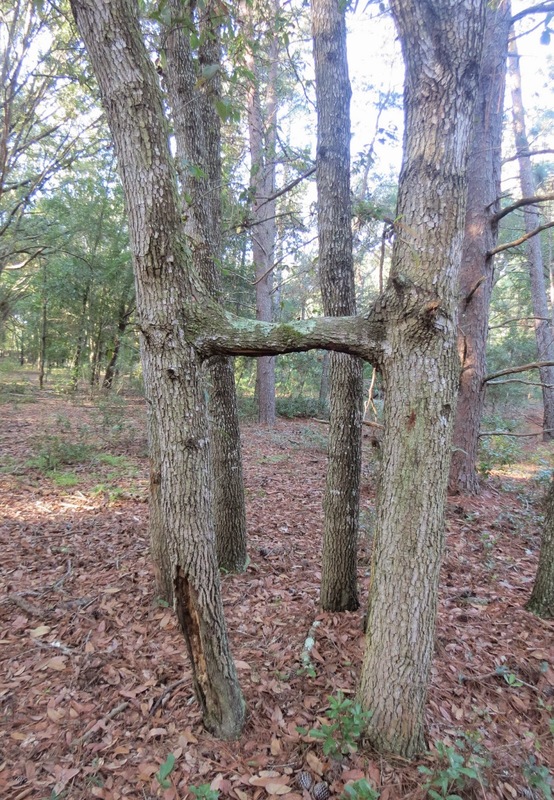 A "Siamese" tree on the Old Field Loop. We walked through the Old Cracker Village. This trail ends at another point on the river. A Great Blue Heron was fishing there. View from the end of the Swamp Trail. Wildflowers on the Sandhill Trail. Banana Spider on the Sinkhole trail. Thistle loved the trails too. Especially when we met critters. I met two new RVing friends, Dave and Vicki. They demonstrated their enthusiasm for Dutch Oven cooking. This was breakfast….pumpkin pie bake. I may have to take up Dutch Oven cooking myself. Dave and Vicki will give lessons at an upcoming get-together in February. Vicki and I went over to the Springs side, recently taken over by the State Park. We took a ride on a glass-bottom boat. View of an old dugout canoe. Our mini RV women forum get-together: Soos, me, Vicki. I took Soos to the Ocala National Forest Ranger Station to get her America the Beautiful senior pass…good for free entry into National Parks and half-price on campgrounds. Soos and I kayaked the river one day. This is an immature/juvenile Moorhen. Little Blue Heron with purple flowers behind it….don't remember the name. The main spring, source of the Silver River. Anhinga swimming…you can see why they also call it a "Snake bird". Immature Little Blue Herons are white. we shared the river with other craft….no-wake rules apply. The Fort-King Paddling trail follows the route of the former "Jungle Cruise." A replica of Fort King, used during the Seminole Wars. We had beautiful weather and I hated to leave. But I am now parked beside water in McIntosh, and look forward to daily breath-taking sunrises outside my door. Lovely trip. Don't know which I like more - the narration or the photos. Thanks for taking me along. Beautiful area. Photos are wonderful as always. That pumpkin pie dish looks great.